If you have a boat, then you’ll need to dock it somewhere. A dock isn’t just a place for boats; it’s also ideal for fishing or get-togethers. 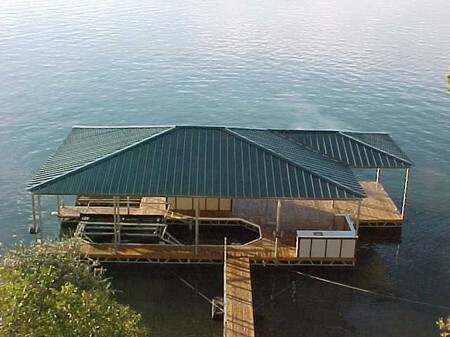 A dock should be sturdy and stable in order to withstand the elements. You can be assured of a gathering place such as this if you know how to build a boat dock. Before you build the dock, you have to decide how big you want it to be. The water depth available will determine how long your landing area is. Deeper waters will need a shorter dock, and vice versa, to guarantee safe docking. Most docks are usually 4 feet wide and extend 12-16 feet out over the water. A second section attached to the first and located in the open water is usually larger, usually 12 feet square. This section is larger to enable and facilitate the movement of larger groups of people hanging around the dock or preparing to board or disembark a boat. You will need to construct a section that is 4 feet wide and up to 12 feet long. In knowing how to build a boat dock, the frame for the first section is constructed from pressure-treated 2″ x 6″ lumber measuring 12 feet long. Three of these pieces are screwed down at one end to a fourth piece that is 4 feet wide. This is repeated at the midsection and remaining end of the longer boards before the frame is completed. The floor boards on which visitors tread can be screwed on to this frame perpendicularly to the longer boards underneath. Construction of the frame for the second section is similar, but it needs to be stronger in order to sustain more weight over a larger area. The framing lumber should lie parallel to one another about 16 inches apart. These serve as a guide for the floor boards to be attached perpendicularly in the same manner as those on the first section. The two sections can be attached together with eye-bolts and steel rods. This allows for easy separation of the sections and free-pivoting motion if the water is rough. Don’t forget to securely attach posts to the side of the dock so that boats can be tied to them, as well as fastening buoys on the side to prevent your boat from scraping against the dock. Knowing whether you should build a floating or free-standing dock is also an important aspect of knowing how to build a boat dock. Murky water around your proposed docking site indicates soft soil, thus needing a floating dock held up with things like Styrofoam. Conversely, sandy or rocky soil, indicated by clearer water, means it’s safe to construct a free-standing dock attached to metal or wooden posts.